Cathy Franzi is a ceramic artist who lives and works in Canberra. She says of her practice, “I investigate ways in which representations of Australian flora on ceramic vessels can communicate ideas about the current environment. My initial training was in science, informing the botanical approach I take to my subject. 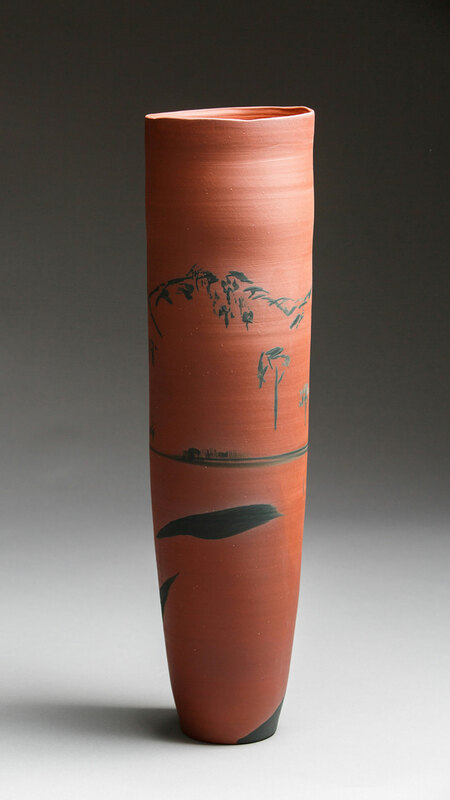 However, it is the love of being in nature that gives me a passion for making – to find ways to express the character of each unique plant and the diversity, and fragility, of environments they inhabit.” Cathy adapts relief print making methods to her ceramics, making her own tools for her impressions. Her marks are clearly visible with individual hand gestures reflecting the characteristics of the plants she depicts. Cathy Franzi graduated with a Bachelor of Science from the University of Sydney in 1985 and, in 2010, she completed her Masters of Visual Arts from the Australian National University. In 2015, she was awarded her PhD from the Ceramics Workshop, School of Art, Australian National University. Her work is held in collections including the Canberra Museum and Gallery, ACT Legislative Assembly, Parliament House Art Collection and Manly Art Gallery & Museum.